Daniel Haber, MD, PhD, director of the Massachusetts General Hospital Cancer Center, was the featured speaker at the 13th annual Phillips Society luncheon. Daniel Haber, MD, PhD, director of the Massachusetts General Hospital Cancer Center, told Phillips Society members that the center's approach revolves around early detection in combination with blossoming precision treatments. Daniel Haber, MD, PhD, director of the Massachusetts General Hospital Cancer Center, outlined the opportunities and challenges in cancer research and treatment today, and a vision to meet them at the 13th annual Phillips Society luncheon at the Four Seasons Hotel in Boston. The approach revolves around early cancer detection in combination with blossoming precision treatments like genetically-targeted and immune-based therapies, Dr. Haber said. The past decade has brought “successive ‘waves’ of breakthroughs for many types of cancer, with some of the toughest cancers becoming the most treatable,” he noted. But treatments for advanced cancer remain arduous and, too frequently, unsuccessful, Dr. Haber added. Roman DeSanctis, MD, Phillips Society Ambassador and director emeritus of Clinical Cardiology, chats with other society members before the 13th Phillips Society luncheon. “What if we could diagnose cancers at a stage when they are most likely to be curable, and when the treatments may be less difficult?” Using the science and technology of imaging and blood analysis, as well as the clinical expertise from across Mass General, to methodically catch cancer early is the Cancer Center’s highest priority, Dr. Haber said. The event, held on Sept. 7, 2018, celebrated the incredible impact of philanthropy from Phillips Society members. The Phillips Society represents those who include Mass General in their estate plan – through a will or other planned gift – and those who establish an endowed fund. 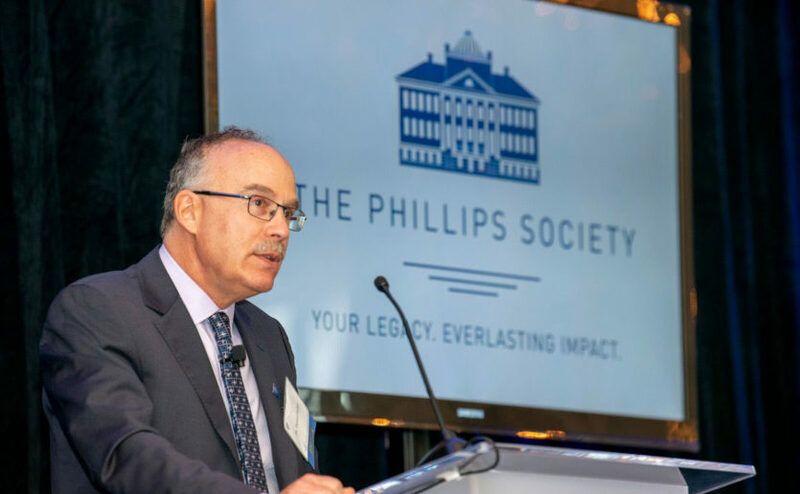 Mass General President Peter Slavin, MD, welcomed the 202 guests and thanked Phillips Society members for being “the lifeblood of this hospital.” Their philanthropic support helps Mass General seize new opportunities in artificial intelligence, gene editing and other exciting breakthrough fields. Private philanthropy propels research initiatives most nimbly, Dr. Haber added, citing financial resources and more physical space as keys to the Cancer Center’s future continued success. Despite being one of the youngest cancer centers in the country, Mass General’s is now a “major force” in the field and solutions are within grasp. “When you can see it, the sense of urgency is even stronger,” Dr. Haber said. For more information about joining the Phillips Society, please contact us. Our donors are setting the stage for medicine’s future.